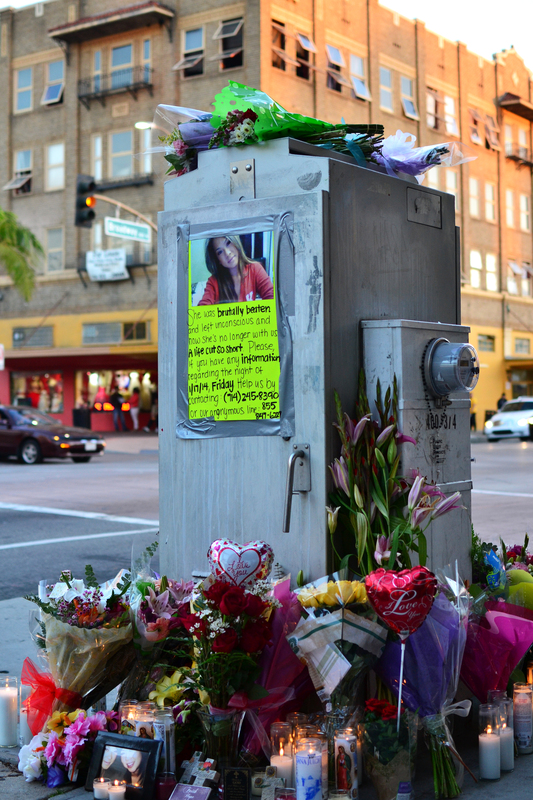 The memorial for Kim Pham as seen on January 20, 2014. SANTA ANA – Attorneys representing the defense and prosecution both said in their opening statements today that witness cell phone videos may play a key role in the trial of two women charged in the January nightclub beating death of Kim Pham. But what those videos show, it seems, is up to interpretation. The two cell phone videos — taken by witnesses of the chaotic late-night brawl outside the now-shuttered Crosby nightclub in downtown Santa Ana — either show that defendants Vanesa Tapia Zavala, 26, and Candace Marie Brito, 27, punched or kicked Pham, leading to her blunt force trauma death, or merely that the two Santa Ana residents were among an unruly group of 20 or 30 people as several fights flared up at the fluid scene, attorneys said. Zavala and Brito are charged with second degree murder and assaulting with force likely to cause great bodily injury. “During the fight it’s nearly always two on one,” said Orange County senior deputy District Attorney Troy Pino, who as prosecutor is representing the state in the case. “The defendants kicked (Pham) on the head when she’s down, and the victim dies from her injuries,” he added, laying out what he says the evidence will show in the trial. The fight was started, Pino said, when Pham’s group was taking or had just taken a photo on the sidewalk in front of the nighclub just after midnight on January 18,2014. It seems like Pham threw the first punch, although witness accounts are murky on that, Pino added. The defense attorneys emphasized this point, arguing that the scene was chaotic and fluid and that Pham was the aggressor. 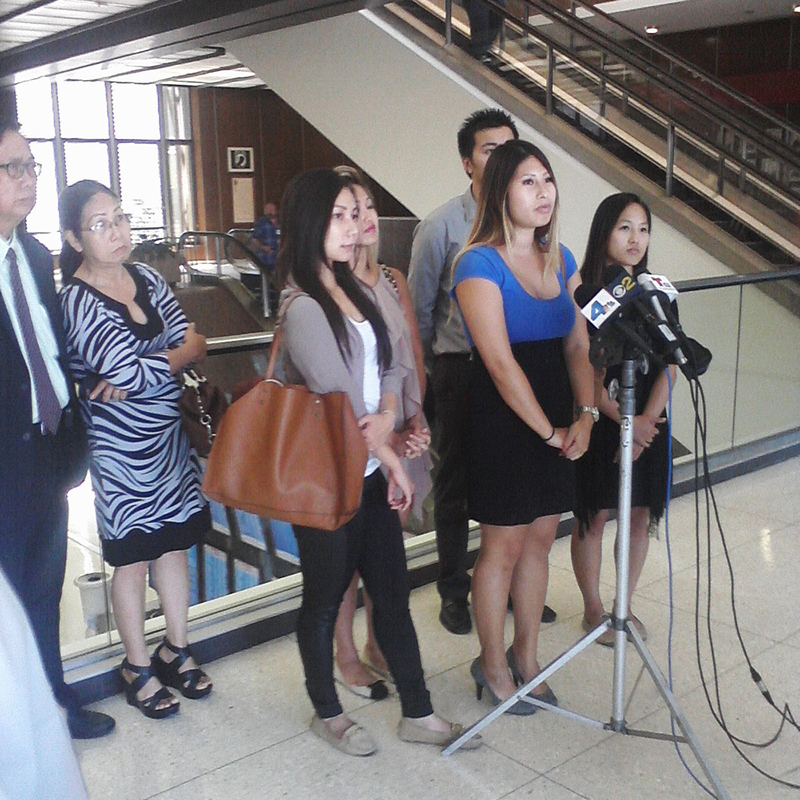 Friends and family of Kim Pham speak at a news conference to show their support for Kim on Wednesday, July 9, 2014. “You’re allowed to hit back when someone hit you,” said defense attorney Kenneth Reed, who is representing Zavala. “The evidence is going to show that (Brito) was defending herself and her friends,” said defense attorney Michael Molfetta, who is representing Brito. The cell phone videos, played several times during the opening statements, show an incomplete picture of the brawl, which began at the waiting line of the busy bar and ran out onto the middle of Broadway and across the street, according to witness accounts. They show other people, including friends of Pham, Zavala and Brito, at times enter the fight, although it is hard to determine what is happening, the attorneys said. Eight seconds of one of the videos has been posted online: View it here. Several people are heard yelling and saying expletives, including at one point where Pham says, “Tell me again, (expletive),” to Amelia, an acquaintance of Zavala and Brito that was involved in the melee, according to Pino. The fight culminated with kicks to Pham’s head, which seven eyewitnesses reported seeing, according to the prosecution. Pham was left comatose and never regain consciousness. She died two days later, giving her organs away as an organ donor. Published July 9, 2014 at 2:30 p.m. Updated July 9, 2014 at 8 p.m.
I’ve seen fights break out outside of nightclubs, but they’ve always been dissolved by the people around them when they take it too far.. Were they all intoxicated? Oh man, this case still bothers me. I feel terrible for the family of Kim Pham. Thank you for the great post, very informative. Nothing in the court, or media, seems to have been said yet whether any of the key players were intoxicated. However, it has been said that Kim’s group had a dinner/party at her house beforehand and had apparently just began bar hoping and that Brito and Zavala’s group had just been leaving the bar.